Just assume a few spoilers are forthcoming in this article. The latest and final installment of Christopher Nolan’s Batman trilogy — The Dark Knight Rises — has the potential to be the most discussed action film since The Matrix because it engages with social currents deeply felt by most people in the world, even those with only secondary connections to western capitalism. 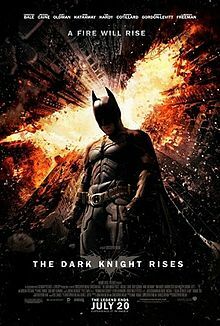 It completes the storyline begun in the first of Nolan’s installments, Batman Begins, in which audiences discover that a secret, world-wide vigilante force, the League of Shadows, has decided that Bruce Wayne’s beloved Gotham City has become irreparably corrupt and must be destroyed in order to restore balance to the world. Batman, of course, thwarts their plot and destroys the League of Shadows at the end of the first film. In the third film the League of Shadows returns, intent once again upon destroying Gotham City. Batman must return from an eight-year retirement to fight them as they carry out a plan to take over the city and threaten to destroy it with a nuclear bomb. But the interesting twist here is seemingly political: the League of Shadows employs the rhetoric of freedom, encouraging Gothamites to “take back their city” as they wrest it from the hands of the big money interests that control it. While I haven’t been following most of the buzz about the film, I have noticed several comparisons to the Occupy Wall Street movement, perhaps suggesting that what the film represents is a caricature or extension of OWS taken to its furthest extreme. What’s particularly interesting is that the capture and then fight to retake the city is punctuated by trial scenes in which wealthy city occupants are not tried, just sentenced to either death or exile (a verdict of guilty is assumed: “This is just a sentencing hearing”). Exile, in this case, means being expelled from Gotham City by walking across a river covered in thin ice, meaning almost certain death. While I’m unsure if the parallel that I’m about to suggest has been suggested already (as I said, I’m not reading most of the buzz about this film), these trial scenes most reminded me of the French Revolution. Bane, ostensible leader of the newly resurrected League of Shadows, is then Robespierre leading the Terror, and “exile” in this case is equivalent to the guillotine, while Gotham City represents revolutionary France, particularly Paris, at the height of the Terror. The director revealing that the film was inspired in part by Charles Dickens’s A Tale of Two Cities undoubtedly reveals his primary source for his imaginative reconstruction of the French Revolution as well. Now the central question of the film seems to me to be focused upon the role or meaning of the film’s political discourse. I would like to suggest that the terrorists’ politics are irrelevant to the film’s meaning. First, we need to remember that the destruction of Gotham City was the goal from the very beginning. Bane’s rhetoric about “freeing” Gotham and returning it to its people was a known lie when he spoke it. It was designed to give Gothamites hope, but hope is not here understood as a positive quality, only as a precondition to complete despair. One must hope, Bane argues, in order to truly feel despair, so Bane encourages hope in order to ensure the psychological as well as physical destruction of both Batman and his city. So a political message was never the point: only the destruction of Gotham City. The rhetoric justifying this destruction can come from a variety of political viewpoints: the initiation of a communist state; the purging of Jews from a pure-blooded Aryan race; the freeing of oppressed people from religion and monarchy; the wrenching of democracy from the interests of the wealthy; liberty, equality, and fraternity — these are all equally important, equally interchangeable, and equally useful and meaningful only as pretexts to mass killing. But, from the beginning, mass killing itself was the only point and nothing else. If it [the will abstracted from intellect, or what Hegel calls “the freedom of the void”] turns to actuality, it becomes in the realm of both politics and religion the fanaticism of destruction, eliminating all individuals regarded as suspect by a given order, and annihilating any organization which attempts to rise up anew. Only in destroying something does this negative will have a feeling of its own existence [Dasein]. It may well believe that it wills some positive condition, for instance the condition of universal equality of or universal religious life, but it does not in fact will the positive actuality of this condition, for this at once gives rise to some kind of order, a particularization both of institutions and of individuals; but it is precisely through the annihilation of particularity and of objective determination that the self-consciousness of this negative freedom arises. Thus, whatever such freedom believes that it wills can in itself be no more than an abstract representation, and its actualization can only be the fury of destruction. In other words, some people really do just want to watch the world burn, and that’s it. But the question left open, then, is the question of violence. The Dark Knight Rises observes that sometimes “our structures become our shackles,” and when these structures are seemingly omnipresent violent revolution seems to be the only way out. Furthermore, American audiences have before them the continual reminder of the example of our Founding Fathers: God may have granted us our rights, but the American revolutionaries had to claim them by force using the barrel of a gun. Because we had to use violence and death to obtain our freedoms, a return to violence and death to ensure them is always a possibility. I do not propose a solution to this dilemma. I would like to observe, however, that the appeal of the Batman films is a strong signal that we are feeling our structures as shackles and are, as a nation, seriously considering the possibility of violence. We don’t do this openly. We do it through our films. But, we are still doing it. I hope we consider what that means, and how serious we really believe our current political and economic situation to be. Interesting analysis, Jim. I’ve posted my extrapolations on your views. Thanks, Jeffery. I look forward to reading your response.